Located off the 105 Frwy in South Los Angeles, the Watts Towers were the creation of Simon Rodia, an Italian immigrant who built them as a work of art and labor of love over 33 years from 1921 to 1954. There are numerous strucutures, with the two tallest towers almost 100 feet tall. A friend from Orange County who had just seen them couldn't believe "Mr Los Angeles" had not seen them. It was time to see them in person. According to a Wikipedia article, "Rodia called the towers Nuestro Pueblo, meaning "our town." Rodia built them with no special equipment or (so far as is known) predetermined design, working alone with hand tools and window-washer's equipment. Neighborhood children brought pieces of broken glass and pottery to Rodia in hopes they would be added to the project, but the majority of Rodia's material consisted of damaged pieces from the Malibu Pottery, where he worked for many years." "Green glass includes recognizable soft drink bottles, some still bearing the logos of 7 Up, Squirt, Bubble Up, and Canada Dry; blue glass appears to be from milk of magnesia bottles. Rodia bent up much of the Towers' framework from scrap rebar, using nearby railroad tracks as a sort of makeshift vise." "Rodia reportedly did not get along with his neighbors, some of whom allowed their children to vandalize his work. Rumors that the towers were antennae for communicating with enemy Japanese forces, or contained buried treasure, caused suspicion and further vandalism. In 1955, Rodia gave the property away and left, reportedly tired of the abuse he had received. He retired to Martinez, California, and never came back. He died a decade later." "In 1959 the city of Los Angeles decided to demolish the structures. The towers had already become famous and there was opposition from around the world. A newly formed private Committee for the Simon Rodia's Towers in Watts negotiated with the city to allow for an engineering test to establish the safety of the structures. For the test, steel cable was attached to each tower and a crane was used to exert lateral force. The crane was unable to topple or even shift the towers, and the test was concluded when the crane experienced mechanical failure. Today the towres are now designated the Watts Towers of Simon Rodia State Historic Park." I have friends here in Los Angeles who attend and are part of Mosaic Church www.mosaic.org. I love that namemosaic. 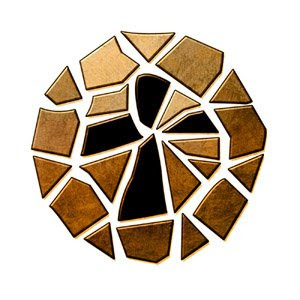 According the the church's web site, the name mosaic "comes from the diversity of our members and from the symbolism of a broken and fragmented humanity which can become a work of beauty under the artful hands of God." In I Corinthians 1:27 & 28 the Apostle Paul writes "God chose the foolish things of the world to shame the wise; God chose the weak things of the world to shame the strong. He chose the lowly things of this world and the despised things - and the things that are not - to nullify the things that are ..."
Watts Towers are definitely worth a visit. www.wattstowers.us Having finally seen them in person, I'm amazed at the incredible work of Simon Rodia and those who worked to preserve his legacy. Watts Towers is a reminder of the broken pieces of our own lives that together Jesus Christ wants to make into His beautiful mosaic.